Is 2019 the year you plan on making the big move to a new home? Are you also having to coordinate selling your current house? These are big tasks to manage especially if you don’t want to pay two house payments at the same time. Everyone knows that staging helps buyers visualize the design possibilities and highlights all of the best features of the home. But, is your furniture covered in a light layer of dust, are cobwebs hiding in the corner and is your carpet a little grungy? A professional cleaning service can be exactly what you need to earn interest from several buyers, and ultimately receive exactly what your home is worth during the sell. Here are six reasons house cleaning services can be your secret weapon for selling your home quickly and at the right price. Professional cleaners bring with them the experience of cleaning homes of all shapes and sizes. This experience allows the problem-solving skills to fight the toughest stain, the most stubborn grease stains and gross soap scum. We also have the tools to ensure the job is done right the first time and every time. Professionals offer quality cleaning supplies and a helpful dose of elbow grease that your home needs before potential buyers show up to make you an offer. When you are staging your home to sell, you want it to look its best. Buyers will see what you have been missing day in and day out. What you need is another set of eyes to combat the mess that’s been in front of you the entire time. That’s where hiring a house cleaning service comes in. You need a team who knows what mess to look for, where they hide, and how to combat them. We’re equipped to remove all the dust bunnies that are hiding in nooks and crannies you haven’t thought about in decades. Who knows, you may want to keep the home after it’s been rejuvenated! Staging a home means showing it in the best light to a potential buyer. Everything looks great on the surface because it’s the first impression that will set the expectation. If you miss something big, then the buyers might undervalue your house. Professional cleaners won’t judge you, we do this for a living, and we know how to handle the toughest cleaning jobs. We just take one piece of the cleaning process at a time. People will be wowed by your home at first glance. As they wander your halls, they will marvel at the cleanliness of your home and begin imagining living in it themselves. That is until they see the little stains on the walls, the dust laying to the side, and the fingerprints on the windows. Normally, you don’t sweat the small stuff. That’s our job. You hire a professional team to ensure small things aren’t left for potential buyers to discover. We come in and take care of the big cleaning projects, and the little detail work that most sellers just don’t have the time for. Right now, you need a team to get your home ready. There are a lot of things you can do on your own, but sometimes, it’s better to delegate. Cleaning your home from top to bottom isn’t something that must be on your todo list. You should do what you do best, and we’ll do what we do best. Instead of trying to find time in your busy schedule, assign the work to a team of professionals you trust to do the work right. At the end of the day, you have more important work to do, like dreaming about a future in your new home. With your home staged, or soon to be staged, you will be looking to finish up any additional projects that will increase the value of your home to potential buyers, right? New paint here, new flooring there and kitchen countertops with this season’s hottest stone! What more could a potential buyer want? Telling potential buyers you’ve hired a professional cleaning service will give them peace of mind that they won’t have to do that themselves if they choose to purchase. It is another perk they’ll have by choosing your home instead of a different option. Hiring a house cleaning service before you stage your home will pay for itself, and it could pay off for you in spades. We want to offer you our services to make sure your home is ready to sell. 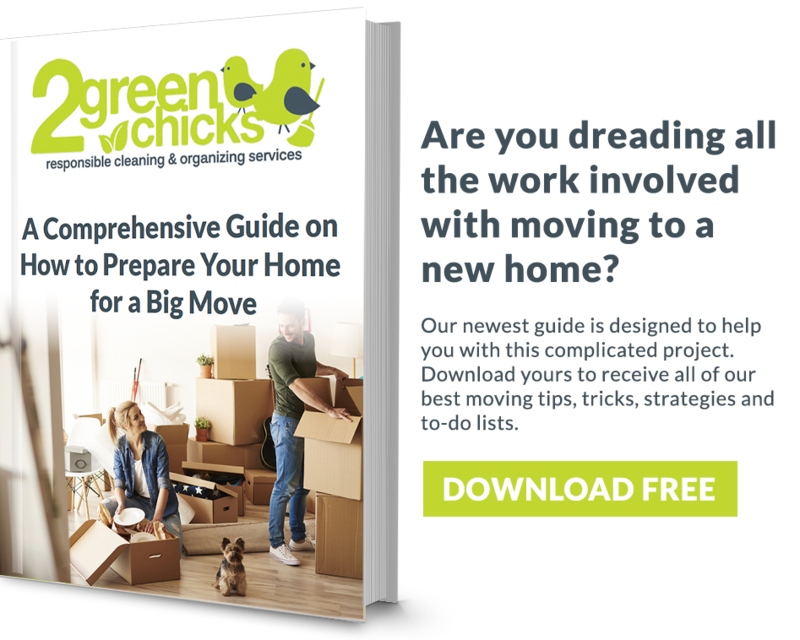 2 Green Chicks is an investment into your future, and we have the tools and experience to make sure your home is move-in ready. Are you still thinking about ways to prepare for a big move? Download our free guide for more tips on how to prepare!